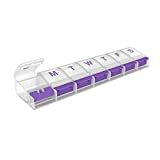 Ezy Dose XXL Push Button Weekly Pill Planner – 7-Day Pill Reminder – This Weekly Pill Organizer is Perfect for Scheduling Your Week’s Medication. Its Push Buttons and Transparent Lid are Simple To Use and Help You Keep Track Of Your Medication Through The Week. This 7-Day Pill Planner is designed for easy use. Its buttons and rounded bottom make it easy to open and retrieve medications. The product’s clear lid allows easy visibility of medication to help prevent missing doses.